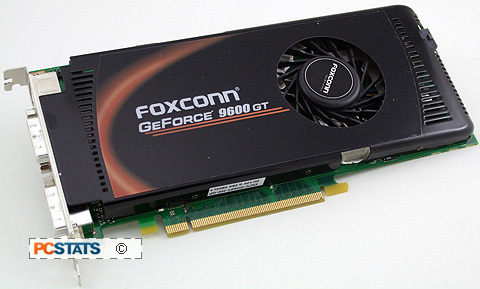 The Foxconn 9600GT-512NOC Geforce 9600GT videocard ships from the factory pre overclocked to 700MHz/2000MHz GPU/memory. In the PCSTATS labs we overclocked the GPU a little higher to 755MHz before things fizzled out. The memory rose to the challenge with a speed of 2328MHz! The Foxconn 9600GT-512NOC Geforce 9600GT is a great mainstream videocard with overclocking potential... and this can also be said about virtually every reference 9600GT out there. If you're craving DirectX10 gaming goodness and a videocard that can handle all the eye candy, the nVidia Geforce 9600GT certainly delivers. For it's class, the Geforce 9600GT offers great gaming results, and comes with an affordable sticker price of $195 CDN ($195 USD, £118 GBP). In the overclocking tests PCSTATS was able to push the Foxconn 9600GT-512NOC to 755MHz GPU, 2328MHz memory. A lot of people automatically assume reference heatsinks aren't up to snuff, yet we found the heatsink that nVidia ships with its reference Geforce 9600GTs to be more than satisfactory. Noise wasn't much of an issue, but the fan is certainly audible when the videocard's under heavy 3D load. Given the choice between a some-times loud single slot heatsink and a slightly quieter dual slot videocard cooler, we'd rather have the single slot heatsink any day. The only shortcoming with this reference-based Geforce 9600GT, and indeed many reference 9600GTs, is that no HDMI-to-DVI adaptor or 2-pin SP/DIF audio jumper cable are included. As Youtube.com gains in popularity, and DVD's breath their dying breath, it only makes sense to invest in a videocard that can output video in both standard definition and high definition quality. The Foxconn 9600GT-512NOC has that capability, and comes with a Component Output breakout box to that effect. An HDMI adaptor would have been icing on the cake. On the strength of its overclockability, and price, the pre-overclocked Foxconn 9600GT-512NOC videocard is a great reference-based Geforce 9600GT videocard worthy of your consideration.